Puravankara Developer is launching their new project Purva Eternity in Kochi. 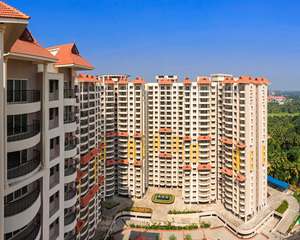 This project is a sprawling luxury enclave of magnificent apartments in Kochi, elevating the contemporary lifestyle. It is located in Kakkanad, Kochi and it is one of the most prestigious address of Kochi with many facilities. Total land area of this project is 5.21 acres. Here the company offers 3 BHK luxurious apartments within the dimension of 1595 - 1742 sq.ft. of area and it is in close proximity to several schools, hospitals, restaurants, shopping centers, infopark, and the upcoming smart city, making it an ideal place to call home. They provide loan facilites by majar banks.Prices are starting from just Rs 53.43 lacs.There are world-class amenities like clubhouse, sports facility, kids' play area, swimming pool, gym, and many more.